Dr. Mohamed El-Sayed, Director of the School of Engineering Technology at Eastern Michigan University, is recipient of the 2019 SAE International Medal of Honor. For more than 20 years, Dr. El-Sayed served as a professor of mechanical engineering and director of the Vehicle Integration & Durability Laboratory at Kettering University in Michigan. 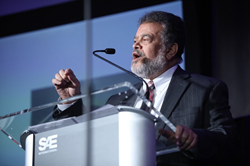 Dr. Mohamed El-Sayed, Director of the School of Engineering Technology at Eastern Michigan University, is the recipient of the 2019 SAE International Medal of Honor. Dr. El-Sayed received his medal at the Awards Ceremony during the SAE International WCX World Congress Experience, held April 9-11 in Detroit. The Medal of Honor, established in 1986, is presented annually and is SAE International’s most prestigious award. The award recognizes an SAE International member for his or her unique and significant contributions to SAE International and is funded through the SAE Foundation. For more than 20 years, Dr. El-Sayed served as a professor of mechanical engineering and director of the Vehicle Integration & Durability Laboratory at Kettering University in Michigan. He is a well-recognized technical leader in vehicle integration, vehicle development, optimization and validation. He also is an SAE and ASME fellow, as well as the Editor-in-Chief of both the SAE International Journal of Passenger Cars - Mechanical Systems and Advances and Current Practices in Mobility: SAE International Conference Proceedings, as well as the inaugural and current chair of the SAE Journals’ Committee. In addition, Dr. El-Sayed is a member of the editorial boards of numerous other technical journals. He has served as a board member, advisor, and consultant to several organizations. Dr. El-Sayed has more than 30 years of industrial, teaching, and research experience, several patents granted, and more than 100 publications in his fields of expertise. He is an award-winning educator, especially in the areas of engineering capstone project courses and online education. Through his teaching and advising, he has contributed to the education of hundreds of engineers now engaged in the field of automotive engineering and product development. Dr. El-Sayed has also worked as a chief engineer, director of engineering, lead engineer, and subject matter expert in the automotive industry. At General Motors, he led the quality, durability, and reliability integration, development, and validation of several vehicles, platforms, and architectures.